Just like at last year’s Gen Con, two Dungeons & Dragons designers came to the dungeon masters’ meeting and spent a few minutes answering rules questions from the gathered DMs. Later in the convention, I intercepted designer Rodney Thompson and got answers more questions. This list collects the designers’ answers. The fighter’s dueling style, which grants a +2 to damage, works with a shield in the off hand. A divine focus can be emblazoned on a cleric’s shield, enabling the cleric to wield a weapon in the other hand and still cast spells. A wizard can hold an arcane focus in one hand and a weapon in another and still cast spells. A druid must hold mistletoe as an arcane focus, so druids must either stash their shield or their weapon to cast. Moving through the space of an ally, even a prone ally, counts as difficult terrain. As a simulation, making an ally’s space count as difficult terrain makes sense, but this rule did not exist in earlier editions. The fifth-edition designers aimed to make the game streamlined, so why introduce this new complication? The designers made allies count as difficult terrain to deal with the side effects of allowing characters to move, attack, and then use their remaining movement. The rule limits the implausible situation where characters move to the front of a line of allies to make an attack, and then move to the back of the line, all in the same turn. We all understand that turns serve as an abstraction to make the game playable, and in the game world, most of the action in a round all occurs simultaneously. Allowing each member of the party to squeeze up, make an attack, then retreat to the back, leaving the tank in front to face the enemy’s attack, exposes a certain absurdity in the abstraction. Apparently, an enemy’s single opportunity attack fails to do enough to discourage the batter-up attack queue. You cannot hide from a creature that can see you. Aside from that limitation, the DM must rule on when a creature can hide and sneak based on what makes sense in the game world. See “D&D next re-empowers DMs; players stay empowered.” The designers tried to write broad rules for stealth, but found that the number of possibilities made the rules too cumbersome for the elegant game they aimed to create. Initiative rolls count as a Dexterity check, so anything that boosts Dexterity checks improves initiative. Multi-classed characters only gain ability score increases when they reach the benefit levels in one of their classes. Although classes gain an ability score increase at fourth level, a character multi-classed to level 2 in two classes does not gain an ability score increase. The missiles in a Magic Missile strike simultaneously. This means the strikes count as a single source of damage for things like resistance and that 3 magic missiles striking a character at 0 HP does not count as 3 failed death saves. Your wizard must decide which missiles will hit which targets before you start tallying damage. If an opportunity attack or other reaction drops you prone as you move, you can still use your remaining movement to crawl or stand. The usual movement costs apply. Spells that include an attack roll can score a critical hit. At one of my Gen Con tables, a cultist scored a critical hit with an Inflict Wounds spell, dealing 6d10 damage on an unlucky first-level character. The target dropped dead. Although my reading of the rules led me to think that spells can score criticals, I failed to find any clear confirmation. After the session, I asked another judge if spells with attack rolls can crit, and he told me that they could not. I felt awful that my misreading of the rules might have led to a character’s death, so I sought out a designer and managed to corner Rodney Thompson. His answer: spells with attack rolls can crit. What a relief. As I wrote in “Rolling in a box,” I want any character deaths to come from foolish characters and crit-rolling dice, not from my failure to apply the rules. The moral: Do not get close to spellcasting cultists. Even without a critical hit, the 3d10 damage from Inflict Wounds puts the spell in line with the damage potential of other first-level spells, although the concentration of damage on a single target makes it particularly deadly. 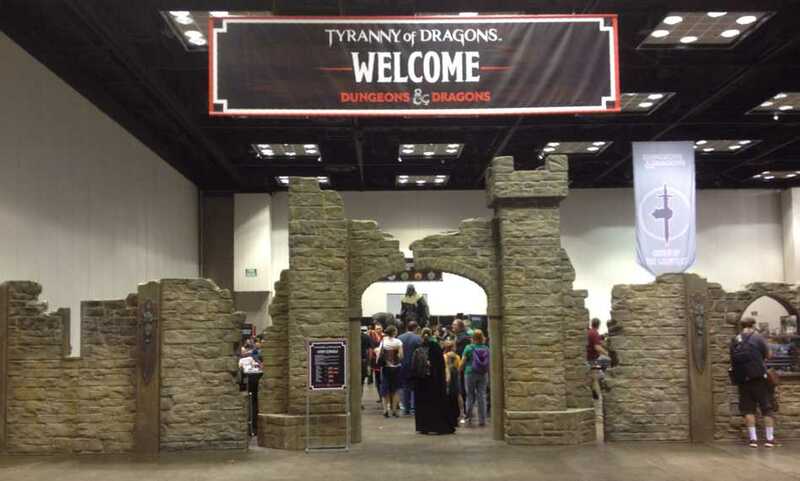 This entry was posted in D&D fifth edition, Rules and tagged GEN CON, Rodney Thompson. Bookmark the permalink. Jut stopping by to say you site is really awesome. Thanks for sharing this knowledge and keep the gret job! I’m glad I found your article and regret it all at the same time. It definitely clarified somethings for me, but I’m so sad my Dwarven wizard/fighter just took a big hit by multi classing. My initial reaction was that the ability score increase being tied to level was a huge hit, but on further reflection I don’t think it’s as bad as it sounds. It is a hit at lower levels, but you make up for it later. In the example of a ftr/wiz, if you level both classes equally, you have to wait until 7th character level (4/3 class levels) to get your first increase (3 levels later than single class), but then you turn right around at 8th character level (4/4 class levels) and get your second increase from your second class, catching up to the single class character at that level. In my mind this is a fair price to pay for versatility of multi-classing, but ymmv. In addition, you can choose to level unevenly if you want the benefit earlier. For example, just level your Fighter to 4, and then start leveling your Wizard (or vice versa). Or, as I have done, I leveled 1 level of fighter, then 1 level of wizard, and will then level fighter the rest of the way to 4th for the next 3 levels. If I were a druid, I’d start developing some kind of weaponised mistletoe immediately, like the magic spear that killed Baldr. That last sentence parses oddly, since we know that other items can also be used as a druidic focus (“a sprig of mistletoe or holly, a wand or scepter made of yew or another special wood, a staff drawn whole out of a living tree, or a totem object incorporating feathers, fur, bones, and teeth from sacred animals”, PHB p.151). So your focus staff can be used as a quarterstaff, meaning you’ve now sufficiently weaponized your shield/staff druid. In the rules, it states that you can use whatever hand you are holding your arcane focus in to gesture for somatic components. Since your shield is your arcane focus, you would do the gestures with your shield. At least, that’s what it would seem these clarifications imply. Your shield becomes your arcane focus in a sense. Thnks!! I also saw in the rules that you can sheath your weapon as part o f your action. So it was not a problem as I thought. What is the purpose of the warcaster feat if a cleric can just put a holy symbol on a shield and cast like that? Doesn’t make sense. I see Warcaster as being primarily for the other melee casters. Eldritch Knight, Ranger, and Arcane Trickster all have legitimate reasons to have their hands occupied, and none of them can use a spellcasting focus. Paladins, Clerics, and all of the primary casters (which can all use focuses) still benefit from the concentration advantage and spell AoO. The rules fail to provide clear answer to your questions about the Cube of Force, but I’ll tell you how I would rule. If you press cube face 5, so nothing can pass the cube, then gaze attacks become blocked. The barrier moves with person who activated the cube, rather than with the cube itself. This means you can’t exit the barrier after you activate the cube. If you fall, you only need to worry about falling damage, not the force barrier. Higher number barriers do not include include lower number effects (except for 5). Pressing a new face of the cube changes the barrier’s effect to the new setting, so pressing 1, 2, and then 3 blocks living matter but not non-living matter.